Barefoot Resveratrol Anti-Aging Tonic: Resveratrol Anti-Aging Testimony - "Freckle in the Eye"
Resveratrol Anti-Aging Testimony - "Freckle in the Eye"
My daughter, Wendy, had what they refered to as a freckle in her eye for the past 8 years. [I'm sure there is another name for it] Every year she would go to have it checked out to make sure there wasn't any changes in it. What they were watching for was cancer. Well this year, 2008, two months after starting on Vivix she had an appointment with the eye doctor. She wasn't even thinking about a change for the better, she was just hoping it hadn't changed for the worst. Well,the doctor looked and looked and couldn't find anything. He even checked to make sure he was looking at the correct eye. I was very glad to hear this news since a friend of mine had the same problem, she missed one of her appointments and the next year when she went to the doctor she did have cancer in her eye. I hope if there's anyone out there with this problem this will help them. 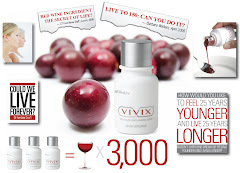 For one thing...don't miss your eye appointemnts and take your Vivix!